As we resume our discussion of Human Factors Engineering (HFE) for medical devices, it's worth repeating that HFE should be wholly incorporated into the development process. HFE is about thinking ahead to catch and prevent potential user errors before they happen. 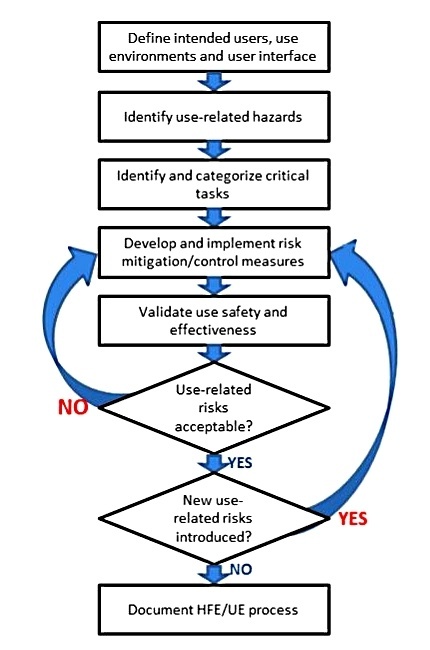 Ideally, iterative testing against anticipated use-based risk would be scheduled in lockstep with development phases. Notice how this is order is reversed in comparison with a project that lacks HFE processes? Without HFE, the common (and, in the case of medical devices, flawed) approach would be to create the product, then provide documentation and training, then implement protective and preventative measures and redesigns in future version or upgrades based on testing of the finished product and/or post-release feedback. That seems like a rational approach, because it lets you gather data on user-errors based on interactions between real users / testers and your finished product. That data can then be evaluated and ranked based on the probability of error occurrence, and the results used to inform requirements going forward. For many products, this is a good approach. But it's unacceptable for medical devices, because the potential severity of harm from user error is much higher. That’s why the FDA recommends that in medical device development, use-based hazards should be ranked and preempted according to severity, rather than likelihood. Again, seems backwards! But I'm sure you see why: without the kind of probability data that you would normally get from testing, you can't reliably anticipate the likelihood of any given error; but without anticipating and preventing potential errors, you can't ensure that testers and early adopters won't be harmed during your device's initial deployment. HFE's “backwards” approach to medical device development is your ticket out of this catch-22 conundrum. First, as you begin each phase of development, your team should work to identify ways that users might interact incorrectly with your device, based on its anticipated final form and any changes made during the previous phase. Having feedback from a representative focus group of targeted users may help with this process. Next, rank the possible incorrect interactions you've identified by severity. If a given error occurs, what might the consequences be? Resist the temptation to under- or over-emphasize certain errors based on gut intuitions about their probability. Then, identify ways you can prevent or mitigate these potential errors, starting with the most severe (unacceptable risk) and working down to least severe (acceptable risk). For every error, seek a design-based solution first (ex. : connectors unable to connect to the wrong component; automation of tasks prone to error when attempted manually), then protective or preventative measures (ex. : security features; warning screens and alerts), and rely on safety information (ex. : labels; manuals) and training only as a last resort. The reasoning behind this design>prevention>training philosophy is straightforward: people neglect information and people forget training. Sometimes people even try to circumvent preventative measures, if they think they're unnecessary or working incorrectly. But product design guides users intuitively into certain modes of behavior or paths of interaction. Even if information is absent, training forgotten or unavailable, and preventative measures are bypassed, design presents the same suggestions for user interaction every time. That's why engineering design for human factors is so important: it's the most effective means of reducing and eliminating use-based hazards. cost of possible fines or lawsuits caused by poor design, an integral HFE process is not only the right choice for patient safety, but the smart business choice as well.